A great choice to slip into any musician's pocket. Decent sound quality. Compact design. Intuitive controls. 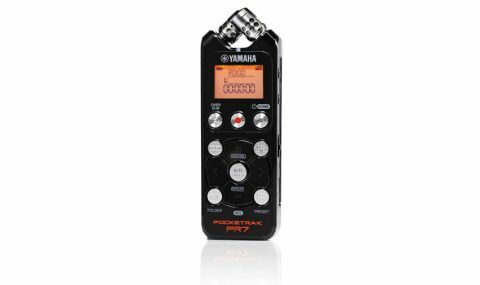 Anyone who makes music can find a use for a portable stereo digital recorder - whether it's for capturing live gigs or rehearsals or for collating fresh musical ideas - and Yamaha's Pocketrak series have fulfilled the role for many. The latest version, the PR7, carries on the tradition of a light, battery-powered, pocket-sized unit that can be taken just about anywhere. "The unit sports a crossed X/Y microphone but you can also plug in an external mic or a stereo line level source"
The PR7 records audio, in formats from MP3 up to 24/96, to 2GB of internal memory or a micro SD/SDHC card of up to 32GB capacity. The unit sports a crossed X/Y microphone but you can also plug in an external mic or a stereo line level source. A tiny internal speaker lets you instantly hear playback, or you can plug-in a set of headphones. The nicely laid-out controls make the PR7 very easy to use. Setting up ￼the recording level is quickly done and there's a high pass filter and dynamics control. For quick working you get five preset modes for a variety of uses (music, personal instrument, bands, field recording and speech) with optimized HPF and dynamics settings. An onboard tuner and metronome and adjustable playback speed can help with instrument practice and there's an overdub mode where you can layer another part over the first recording. Files can be transferred to computer via USB for editing with the included WaveLab LE software. Sound captured through the mics is clear with decent depth and imaging which, combined with the portability and other facilities, makes the PR7 a great choice to slip into any musician's pocket.